In a small saucepan, heat the balsamic vinegar and simmer until reduced to half of its original volume, and it becomes thick and slightly syrup-y. Cool until ready to use. 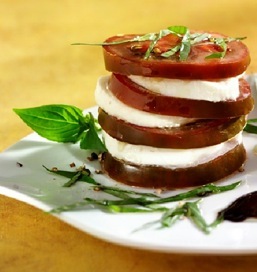 On individual plates, stack the tomato slices alternating with the mozzarella slices, starting and finishing with tomato. Each plate should have 4 slices of tomato and 3 slices of mozzarella. Sprinkle each tomato/cheese stack with sea salt and cracked pepper, drizzle with olive oil and sprinkle with basil. Artfully drizzle a stripe of balsamic reduction on the side of the tomato stack and garnish with basil leaves. This salad is remarkably simple, but impressive in its presentation. Dazzle your friends with this dish as a gourmet starter to a meal.